The following is an interview with Owner/Head Chef of Dublins Award winning Amuse Restaurant Conor Dempsey. Conor shares with us his insights into the restaurant industry and what his passions in food are. Was there anything that you thought you wanted to do before you started cooking? I started cooking at 16, so all I remember was, doing my level best to get out of school, so I kind of fell into it, and I was hooked from the start. If I had a choice now, I would have liked to study History and become a Historian, I know sounds weird but.. I have a big interest in early Human History and Evolution. Which talent would you most like to have that you don’t possess? Is there anything you wouldn’t serve on your menu? Yes, lots of things! Green Peppers come to mind, The Roe from Scallops, I can’t understand why any Chef would serve them. Green Peppers and Scallop Roe! Any advice for a young chef/someone starting out in the industry? My first piece of advice would be to leave Ireland, go to France or Germany and get as much high quality experience as you can. Don’t let the language barrier stop you, with a good attitude you’ll be fine. It’s hard but essential for a succesful career as a chef. Any advice for the keen home cook? Try to cook gently, don’t turn the gas up to full, turn the oven down a notch and take your time. People, chefs included, always seem to use too high a heat and in my experience food doesn’t like searing hot pans etc..
My Grandmother’s Beef stew, legendary. Favourite ingredient at the moment? 3 year old Kamebishi Soy sauce from Okinawa Japan, incredibly pure and mellow flavour, truly like no other Soy sauce you are likely to encounter. 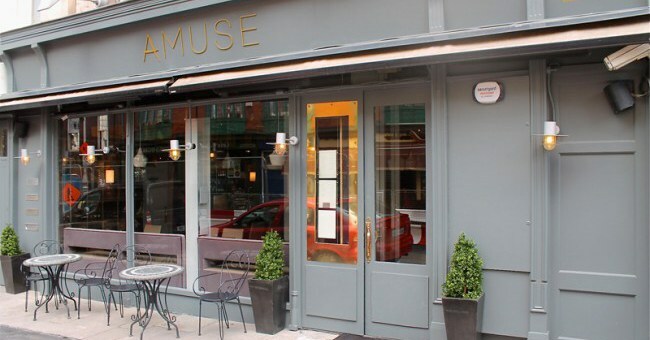 You recently won Best Newcomer at the RAI awards – as the “Newcomer”, what would you want people to know/understand about Amuse? We try to cook the best food we possibly can while keeping the price point fair. We would love people to come to us with an open mind and I’m aware that a lot of the ingredients we use are unusual but I think our customers really enjoy that about us. In your opinion, which dish on your menu best represents you as a chef? “Hamachi, Bergamot, Horseradish, Yoghurt, Timur Pepper” It’s the most complete dish we have on the menu. It has it all! Salty, Sweet, Bitter, Sour, Umami, in my humble opinion it’s not far off perfect. What foods are you craving the most right now? Fresh fruit, it’s summer! The hardest thing to get in Ireland is good tasty Fruit. Is there one food that you’re secretly obsessed with cooking? What kinds of ethnic food do you think are underrated right now? Korean food in all it’s glory can be neglected over in this neck of the woods. Has there ever been an ingredient that you weren’t able to master and have given up on? How much does the time spent in Paris still influence your cooking? In every way, I love France and go back as much as I can! Your food guilty pleasure/off duty comfort food? Milano with my wife and kids, the little ones love the dough balls!